Waterfall vs Agile: Which Framework Should You Use For Your Project? Everything is constantly changing in the tech world – it’s becoming more of our everyday world. On the other hand, deciding a product in the tech world to invest is giving users a hard time. The same can be said for UX project frameworks. Choosing a project framework is often the most difficult part for those who are in the field of UX. Sometimes, getting a team to function together as one can be challenging. The UX industry is experiencing a real boost of project frameworks types. Each organization has its own framework to design a product and solve the user-centered problems. The most widespread and popular one being – Agile. However, I strongly believe that there is no ‘one size fits all’ when it comes to project frameworks. It is crucial to know your project scope when you are deciding a project framework to follow. What your organizational goals are? What are the client and stakeholder needs? What are the size and characteristics of the team? What are the time and budget limitations? Without answering these questions, it would be really difficult to streamline the UX framework you want to follow. Having said that, I will now do an in-depth analysis of the two most conventional and mature frameworks – Waterfall (‘Traditional’) and Agile. Having its roots built up from the manufacturing and construction industry, the Waterfall framework is a linear and sequential process in and out. It has distinct stages for requirements gathering, design, development, and testing. In this framework, rigorous research is done twice. The first one is in the requirements gathering and design phase which is also referred to as the discovery phase. The second phase starts at the very end of the development phase. Though it is a very simple and straightforward process, it comes with its own drawbacks. Due to its rigid structure, it doesn’t allow a high degree of flexibility and has no margin for errors. That being said, now let’s have look at the pros and cons of the Waterfall framework. As the team agrees on what will be delivered at the end of the project cycle, it makes it easy for the client and stakeholders to envision the final product at the very beginning. Every phase in the Waterfall framework has a defined start and end point. Teams have to complete an entire phase before moving on to the next one, so if there are roadblocks to completion, they’re brought to light right away. Being liner in nature, teams can neither move forward without completing the previous phase nor move backward. So this approach helps in enforcing a discipline within the teams. Every team member is aware of the fact that any delay caused by them will affect the whole project. This framework’s approach is highly methodical. Everything is recorded – from the project’s conception to its completion. Due to its sequential process, every new phase involves a new group of people and if everything is well documented, it is easy for them to take charge of the project from that particular phase. This also helps when there is a new addition in the existing team. New team members can simply refer to the documentation and start working on the project right away. As discussed earlier, in this framework there is no looking back. It leaves almost no room for unexpected changes. Any sudden change in the project plan or unplanned roadblocks would hamper the work carried out up to that point, which would derail the entire timeline. Frank Chimero (Author – The Shape of Design) said, ‘People ignore design that ignores people.’ This is actually true when it comes to designing a product. In the Waterfall framework, the entire product is tested in the end by the users and they are not involved in the middle phase of the project. In my opinion, this is the biggest drawback of this framework. Involvement of the users during the whole process is necessary and it results in a user-centered product. In the early 2000s, a new framework called Agile emerged. It expresses rapid, iterative cycles of launching, measuring, and pivoting as needed. One thing to note here is that there are no distinct sections for each phase. The whole team works in short chunks of time called sprints, in which they execute small tasks and are assessed on an ongoing basis. In comparison to the Waterfall framework, an Agile framework is flexible and can be repeated all over again. It focuses on gathering user feedback by allowing continuous user testing. As every other framework has both pros and cons, Agile is no different. Let’s have a look at its pros and cons. This framework encourages a high level of collaboration with actual users. This not only helps in gaining visibility of the product but also helps in getting the users’ feedback at every step. If a team is following this framework, they usually get to see a working prototype of their product at a very early stage of the process. 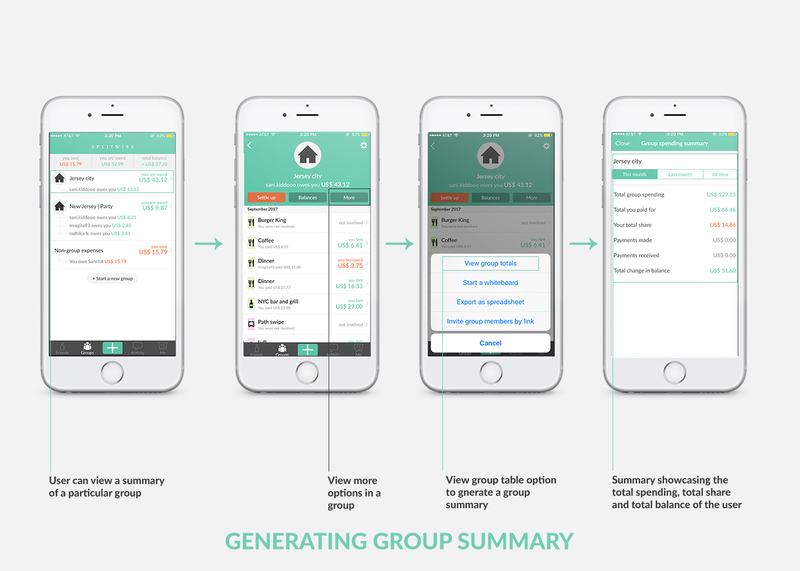 Due to its iterative nature, the team has to make constant iterations in the prototype based on the users’ feedback. This framework also helps the organization in releasing a minimal viable product – a product which is good enough to get you in the game. Once the product is out, there is always a scope for improvements and updates. 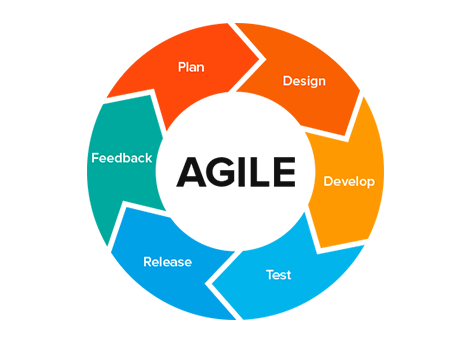 As we know that Agile framework works in sprints, it becomes fairly easy for the organization to keep their product up-to-date with the last technological advancements. This framework doesn’t require a definitive plan to get started. At the end of every sprint, new requirements can emerge, while existing requirements can evolve. This is where the team can fall off the track and come up with a totally different product than what was initially intended. Agile’s sprint cycle leave’s one important component behind, and that’s documentation. Unlike Waterfall, Agile is not a well-documented process. This can be a problem for the new members who join the team. They will be unaware of certain design decisions and how they have to move forward in that particular project. This can create a lot of misunderstandings and difficulties within the team. Which Framework Leads to Success? Both the frameworks have had critics and supporters since their inception. In my option, it totally depends on the type of project and the team structure. There are several variations of both Waterfall and Agile frameworks, and each organization will have their own take on them. Some organizations are starting to embrace iterative testing in the Waterfall framework and some are incorporating upfront research into the Agile framework. As I said earlier, there is no one size fits all solution but understanding the scope, risks, and obligations of your project can help you best identify when and what kinds of a framework will make sense. 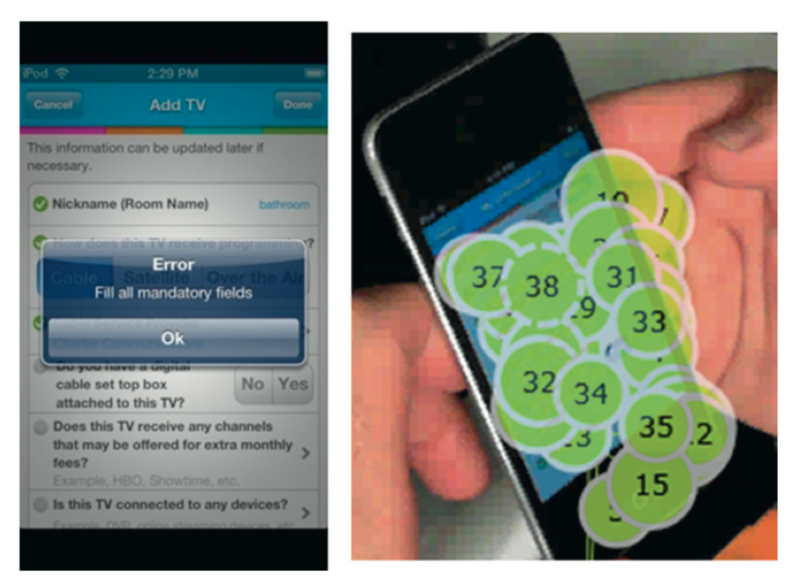 In today’s world, usability testing is critical for designing user-friendly interfaces. These tests take on different forms and methods that help designers identify usability issues. This is critical when analyzing the bridge between design expectations and user behavior. Sensory-based technology, such as eye-tracking, has been revolutionary in gaining deeper insights on how users interact with technology. Eye Tracking is a usability method and tool that reveals users’ focus points and navigational patterns on a given interface. It provides designers with thorough feedback on which interface elements are visible and attention-grabbing. 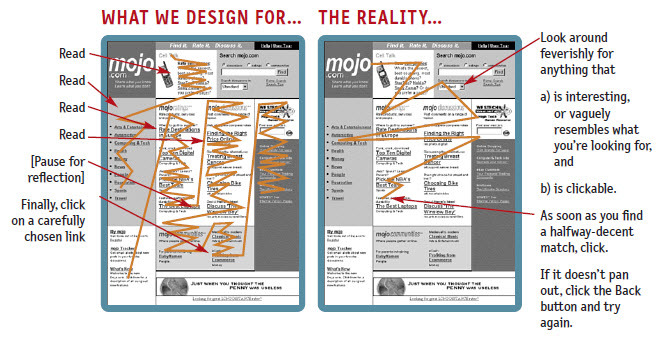 It also effectively evaluates design/content hierarchy. Eye Tracking is an insightful form of research technique, which determines the user’s focus and attention of the user. Considering that more than 80% of the population has access to mobile devices, the percentage of mobile internet usage is surpassing traditional computing platform usage. Today’s world is mobile-centric. Thus, making it important to focus on the usability of mobile devices. 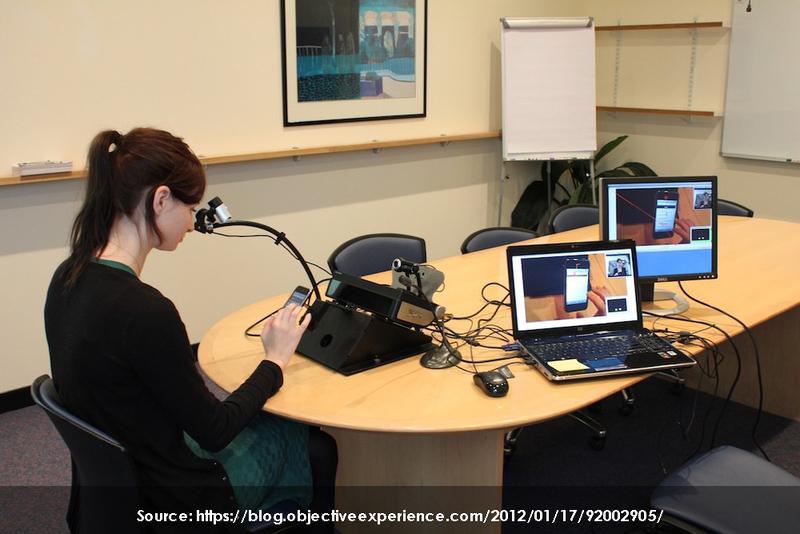 Jen Romano Bergstrom, a User Experience Specialist conducted a research study to compare the user experience of the same interface across multiple devices using eye tracking. As a result, she uncovered different issues across different devices. Below is the heat map of the data. The red spots are the main focus points, and the green and yellow are the areas which get less attention from the users. It is clearly visible that users have a different area of focus for the same interface on different devices. Steve Krug, an information architect and user experience professional who is best known for his book “Don’t Make Me Think – A Common Sense Approach to Web Usability”, mentioned that designers keep in mind that the users first read before act. Content is read through before other links are carefully chosen and clicked. The reality is that people don’t read everything, they just read what they want to. This is a big takeaway, and reinforces the importance of usability tools such as the eye-tracking device. Jen Romano Bergstrom explained some key guidelines on the best UX practices that every User Experience professional should follow. These practices were drafted after several eye tracking researches were performed. Icons and images should be clickable across the devices as users expect them to be interactive. Making things clickable on the homepage will help make the page more intuitive. If an error message pops up, it should explain what the error message is all about. Below is the example from one of Jen’s research. On the left side, an error message popped up. However, it was not clear to state which mandatory field was to be filled. On the right side of are the user’s gaze plots. The user is trying to search all over the screen for the mandatory field which is left. So, the error message should clearly point out the problem in order for the user to quickly move forward. Keeping in mind that the users have access to multiple devices, an interface’s layout should be consistent across various mobile devices.  The flow of information should remain the same as good design gives users a consistent mental model throughout all platforms. Despite the fact that eye-tracking is a time consuming and expensive process, it is a very useful technique to gain deep insights on a particular product. 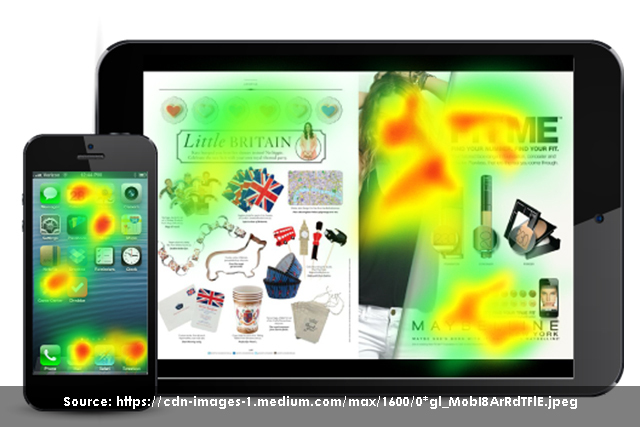 As far as the use of eye tracking in mobile devices is concerned, there is a lot more to explore in this area. Following these suggested UX practices will significantly improve the user’s experience. 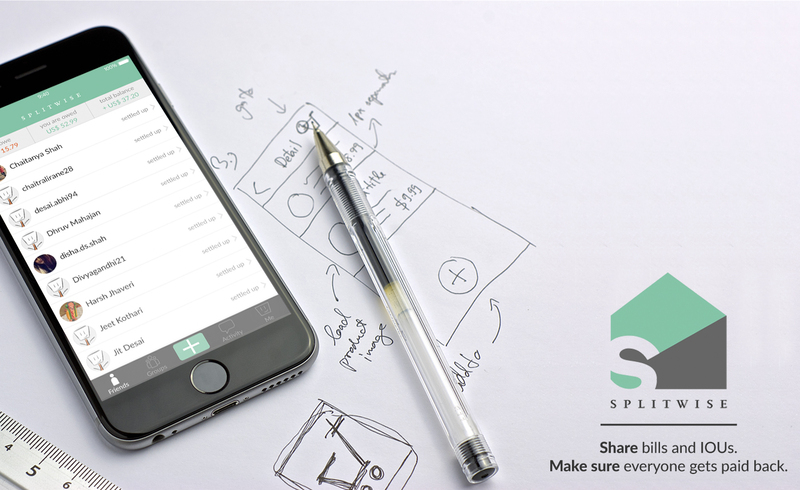 Based in Rhode Island, Splitwise makes the life easier as it lets the users pay their debts via PayPal or Venmo. Don Norman once said, “Knowing how people will use something is essential.” Following his guidelines, Splitwise has perfectly used two of the most important characteristics of good design: Discoverability and Understanding. On signing up, the application clearly indicates what are the possible actions and how to perform them. Splitwise has a very simple user interface which is very easy to use. 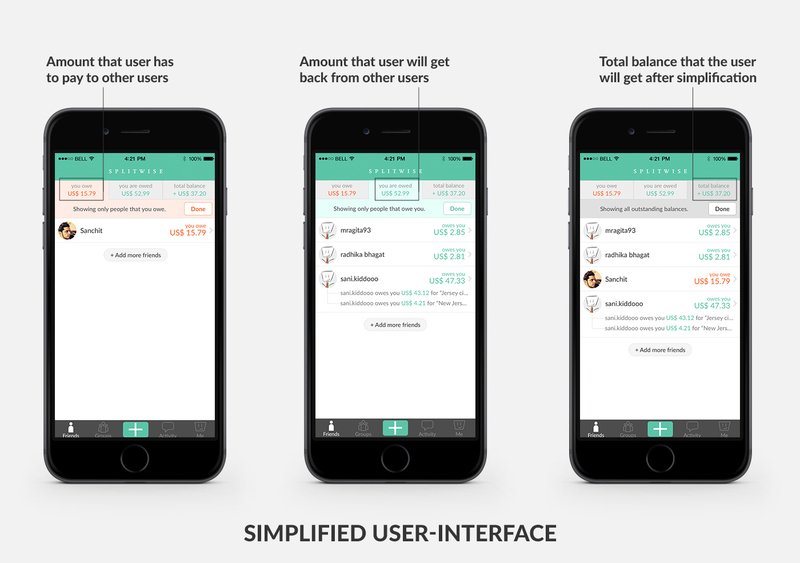 The home screen of the application has three tabs: you owe, you are owed and the total balance which helps the user in keeping a track of their debts. 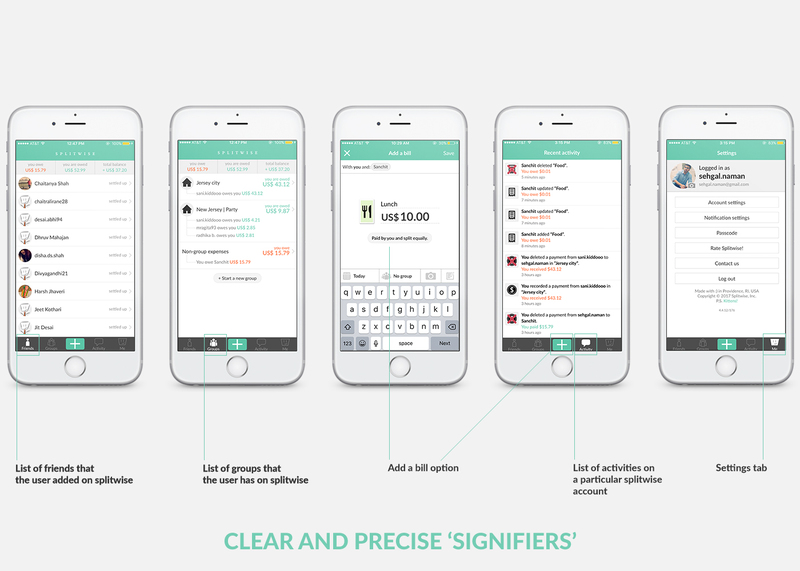 Following Norman’s Design Principles, this application has clear and precise ‘Signifiers’ for the navigation options wherein the user can browse the list of friends, make groups, track activities, add a bill and can access the settings of the application. Splitwise has also adopted Apple’s 3D Touch feature in order to enhance the user experience as they can simply view the balances or can add a bill using the 3D Touch feature. While going through the app, I think the user has to scroll all over the friend list in order to search for a friend whose name starts with ’S’. This can be a little frustrating if he has a long list of friends on Splitiwise. To avoid this, I would recommend them to have a search option for a better and enhanced user experience as it will be more convenient for the users to navigate to a particular account. 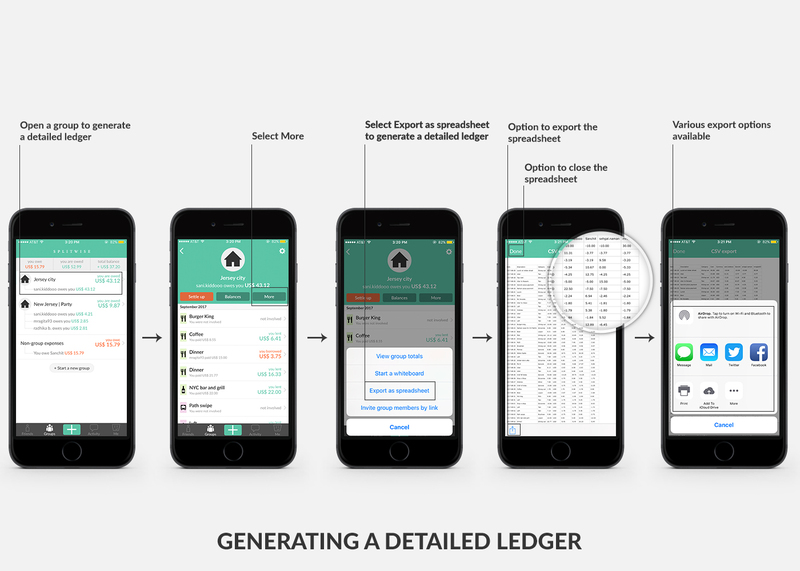 As I said before that this application helps in keeping a track of your debts in a simple ledger format. 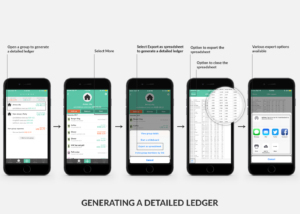 It allows the user to generate and export a detailed ledger so that the users can keep a track of all the activity with date, description, total cost, etc. 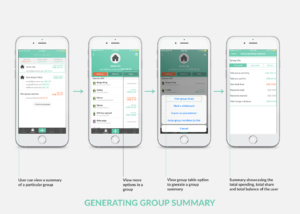 It also provides an option for generating a group summary wherein the user can track the total group spending, total amount user paid, total share and remaining balance. I think Splitwise has done a wonderful job when it comes to following Norman’s Design Principles. This application is magnificent in providing Feedback. 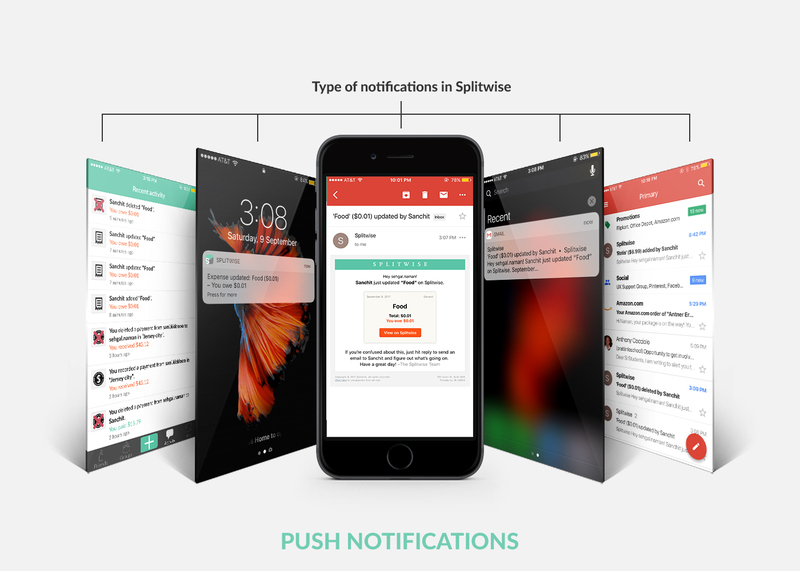 It sends push notifications and emails to the user whenever any activity is added or deleted. It has an activity tab wherein the user can keep a track of all the activity with any other user. 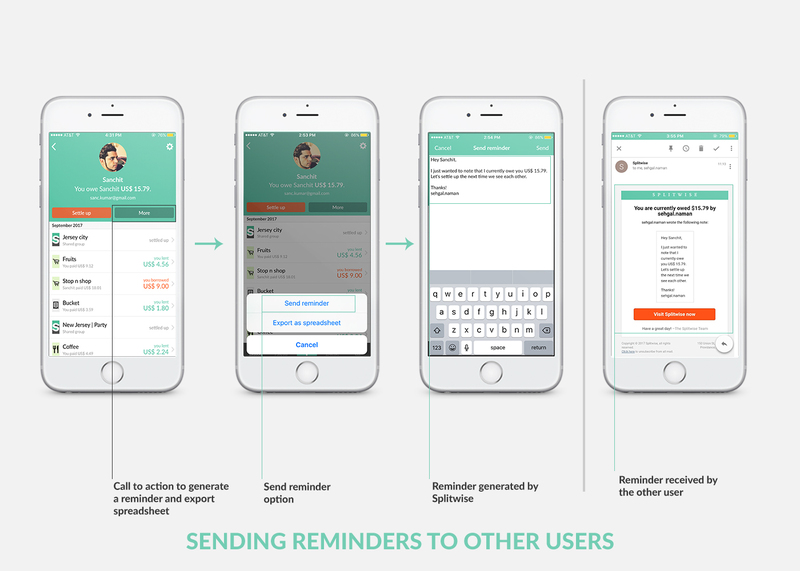 Splitwise also has an option for sending reminders where the user can generate gentle messages for due payments. 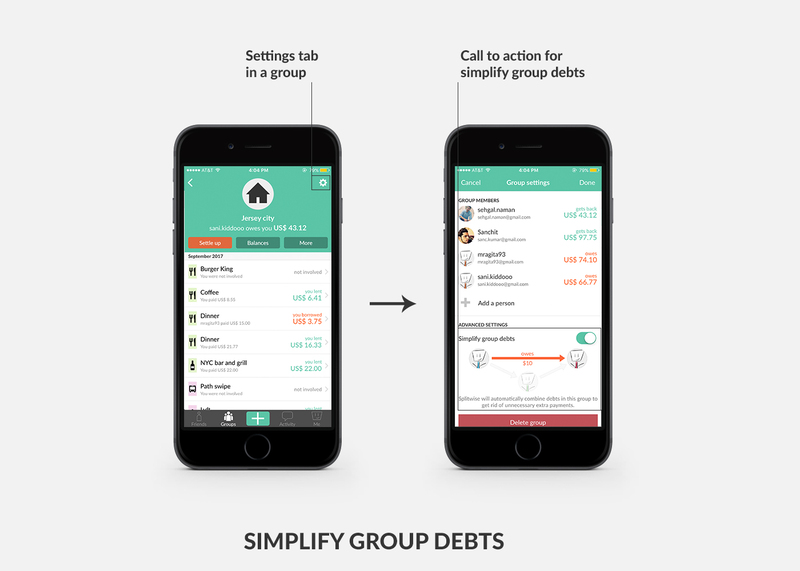 As the application’s main objective is to help users simplify their debts, Simplify Group Debts is one of the best features of Splitwise wherein the user allows the application to restructure debt within groups and across friendships. 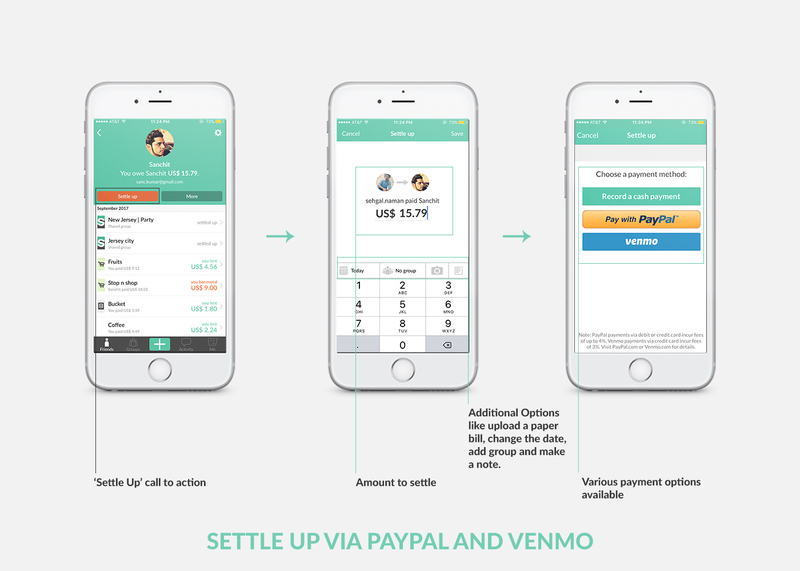 Splitwise users have an option of ‘Settle Up’ wherein they can settle theirs accounts with other users using PayPal or Venmo. I believe this is a Constraint as it restricts the users to use these two payment gateways in order to process payment for Splitwise accounts. I would recommend them to add more payment options so that it is easy and convenient for the users to process payment for Splitwise accounts. 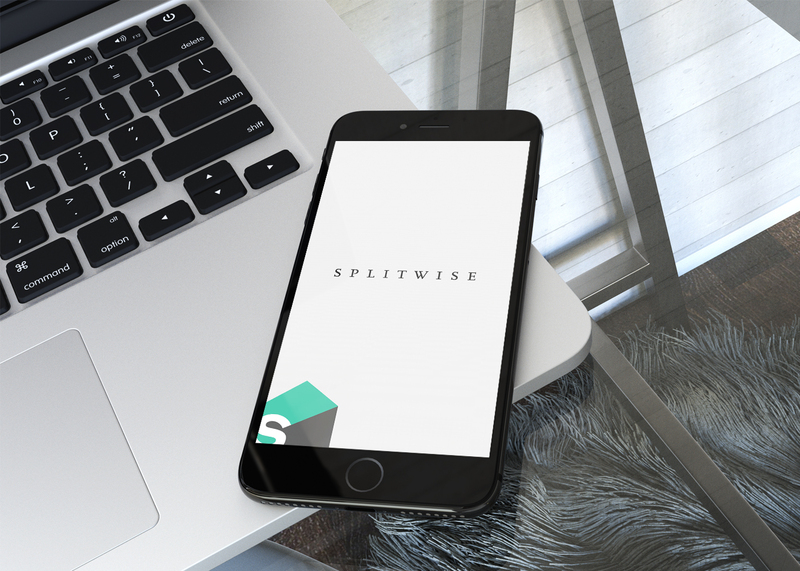 Considering all this, Splitwise is a user-friendly application which provides its users with an easy and systematic way of maintaining accounts for various expenses incurred with friends or family. I firmly believe that it has followed the various design principles in the best possible way. However, some improvements in the application can enhance the user experience but as Don Norman said “In my opinion, no single design is apt to be optimal for everyone.”, It is really hard to fit everyone’s need.